Mobile Marketing. It can seem confusing and seasoned business owners might even say it feels a lot like just another marketing trend, but look around you. Everyone has gone mobile! Do you see anyone without a mobile device of some kind? 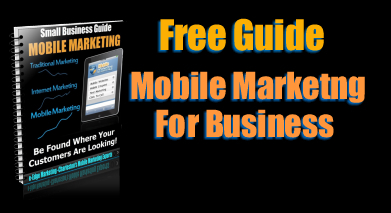 Heads up business owners, mobile marketing is here to stay and you need to get up to speed pretty quickly or be left behind by your competitors who see the big picture. Think about this; 98% of smartphone users said they use their mobile devices to search for local businesses. Don’t take that too lightly, think about that. These searchers are ready to do business! As a matter of fact, 88% of them have been shown to have taken action on that search within 24 hours. What is taking action? It simply means that they have taken an action as a result of the search. They might have called the business, visited the business, or made a purchase at the business they searched for. You would have to agree that might make a pretty impressive difference in your bottom line if your business’s website showed up in those mobile searches. But does it? You may be familiar with the terms mobile advertising, mobile websites, QR Codes, iPads, text messages, Mobile Applications (apps), and smartphones. But what about multimedia messaging service, location based mobile services, call to action and tap to call? What are VIP Clubs, mobile coupons, and text to win mobile campaigns? You may have even heard many of these terms and you might have wondered what they mean and/or how they fit into your business’s overall marketing plan. How Mobile is changing the marketing landscape. How Mobile Marketing Can Increase Sales Immediately! Strategies to attract new customers in your local market. How to keep your best customers and turn the others into great customers too! How with mobile you can come up with an idea this morning and have customers coming through your door to get it this afternoon. This Guide is being updated.